Justin Ross "J. R." Sweezy (born April 8, 1989) is an American football offensive guard for the Tampa Bay Buccaneers of the National Football League (NFL). He was selected in the seventh round, 225th overall, by the Seattle Seahawks in the 2012 NFL Draft. He played college football at NC State. Sweezy grew up a North Carolina State Wolfpack fan as his grandfather had previously played fullback for NC State. As a linebacker at Mooresville High School his junior year he recorded 115 tackles, eight tackles-for-loss, and three sacks. He played linebacker and recorded 195 tackles, 14 tackles-for-loss, six sacks, and four forced fumbles in 12 games his senior year. He also wrestled winning the Class 3A Heavyweight Wrestling Championship for North Carolina. Sweezy played 35 games with 20 starts along the defensive line at NC State, starting every game his junior and senior seasons. He recorded 86 tackles (65 solo), 22 tackles-for-loss, 11.0 sacks, 33 quarterback pressures, three passes defended, two forced fumbles and two fumble recoveries. He was voted team captain his senior season and was selected honorable mention All-ACC his junior year. He appeared to have his share of off-the-field issues, including being arrested for having pot in his house, and for assaulting a 65-year-old bus driver. Coming out of NC State, Sweezy wasn't a highly sought after draft prospect at defensive end. However, Seahawk's offensive line coach, Tom Cable, saw something in him. After agreeing to switch to the offensive line the Seahawks drafted him in the seventh round of the 2012 NFL draft, reuniting him with former college teammate, Russell Wilson. In his rookie season Sweezy got the first start of his career in the season opener against the Arizona Cardinals replacing veteran guard John Moffitt. He again started for the injured Moffitt in the last two games of the regular season against the San Francisco 49ers and St. Louis Rams. During the 2012 campaign he had three starts and played in 13 games. 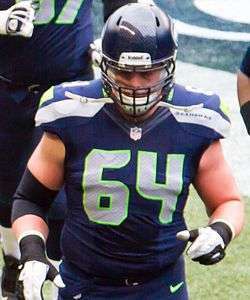 For the 2013 season Sweezy started 13 regular season games and in the post season for a Seahawks team that would go on to win the Super Bowl that year. In 2014 Sweezy had his first season where he started every regular season game at right guard. The Seahawks would go on to return to the Super Bowl losing to the New England Patriots. On March 9, 2016, J.R. Sweezy and the Tampa Bay Buccaneers agreed to a five-year deal worth $32.5 million. He underwent back surgery after signing with the Buccaneers and was placed on the Physically Unable to Perform list which will ultimately make him unavailable for the first five games of the season. ↑ "Sizing up J.R. Sweezy". Retrieved April 29, 2012. ↑ "NC State Wolfpack Bio". ↑ "J.R. Sweezy, DS #37 DT, North Carolina State". NFLDraftscout.com. Retrieved November 27, 2016. ↑ "Sweezy NFL Combine". Nfl.com. Retrieved January 19, 2013. ↑ "NFL Draft 2012: Seahawks Select J.R. Sweezy In The 7th Round". Retrieved April 29, 2012. ↑ "Seattle Seahawks Guard JR Sweezy's drive led to successful transition". ↑ "Young Seahawks Add Two More Rook Starters". ↑ Sander Philipse. "J.R. Sweezy set to miss five games with back surgery". BucsNation.com. Retrieved November 5, 2016.